It is that time of year to clean out the freezer and look ahead to (hopefully) filling it back up with the bounty of the fall hunting season. Venison steaks and chops are excellent when marinated and grilled (stick to medium or medium rare for tenderness sake), but for a change of pace, you could also make venison “veal” cutlets. 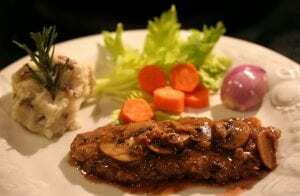 These tender morsels can be eaten simply or interchanged with any veal recipe (e.g., venison veal Parmesan, venison veal Marsala, venison veal piccata). 1. Starting in the morning, cut the venison into pieces about the size of a deck of cards (chop size). 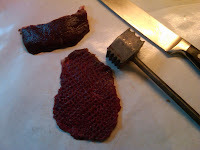 Then pound the venison until they are about 1/4 inch thick, using a meat mallet (tenderizer). 2. In a glass bowl, add 1 qt. water and 1 Tbsp. kosher salt, stir to dissolve salt. Add the onion, herbs, and submerge the pounded veal pieces in the salted water. Cover and place in the refrigerator. Drain and change the salted water at least every hour (every half hour for the first 2 hours is even better). The venison will start to lose its red color and become pale and tender like veal. It is best to have all day for this process, but it can be achieved in 2 hours (or even less if strapped for time). 3. Once the venison has transformed into veal-like qualities, you can cook it cutlet style…place milk in one bowl, the mixed egg in another, and the seasoned bread crumbs in a third bowl or plate (no need for more salt because of the salted water brine). 4. Heat 1-2 tablespoons of olive oil in a fry pan. Place each cutlet first in the milk, then egg, and then coat with bread crumbs. Fry in the olive oil 2-3 minutes per side until golden brown. These are delicious hot out of the pan with just a squirt of lemon and parsley or you can proceed from here to make venison Parmesan or Venison in a Mushroom Vermouth sauce. Venison meat tends to have far fewer calories and fat than veal. Enjoy!